Andrew Bell was born in England during the waning days of the rip-roaring 70’s. As a wee lad, he packed a lunch and headed for the U.S.A. to pursue dreams of monster truck racing and professional skateboarding. Today, Andrew lives, works, and slowly absorbs industrial waste in Brooklyn, NY. From his shelter, he operates Dead Zebra Inc which produces artwork and projects such as ‘the Creatures in my Head’ series. His work has been featured in publications ranging from the New York Times to Wired and Juxtapoz magazines and in gallery shows worldwide. 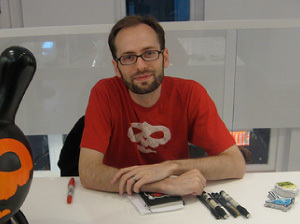 Andrew has been working with Kidrobot on various projects since 2005 (and shopping there since 2002). Read more about Andrew Bell here on the KRonikle, or shop for Andrew Bell on kidrobot.com.